After you've done some exploratory visualizations, you might want to share some of your analyses with co-workers. To do this, you first need to publish your data and report to the Power BI cloud service. Save your work, then go to Home > Publish. You'll need to sign into your Power BI account if you're not currently logged in (or create one if you don't yet have one). I tried out Quick Insights by duplicating my project (I did a Save As to another name), and then grouping data by destination city, airline and flight. 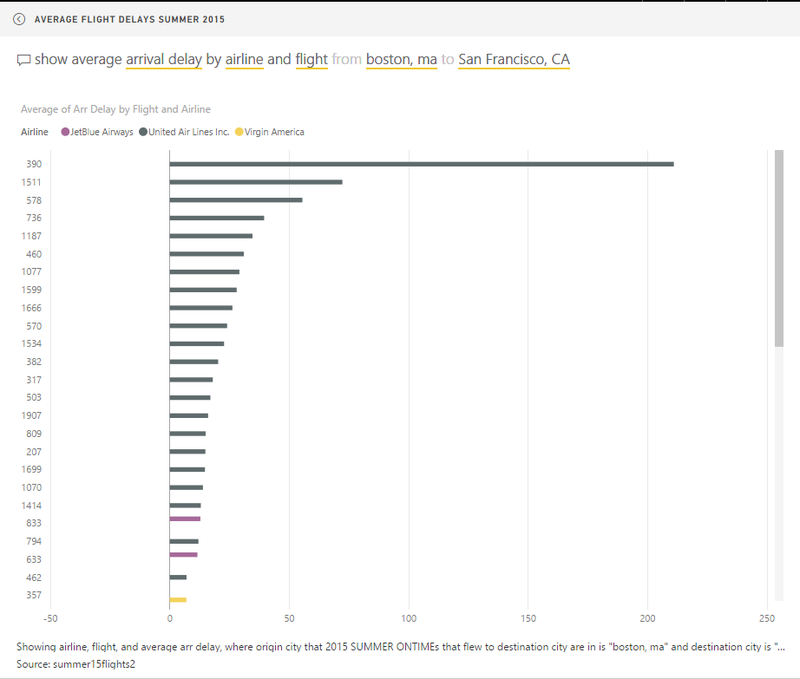 (If you want to follow along, go to Edit Queries > Transform > Group By and follow the dialog box to create a new column of average arrival delays, select Close & Apply, re-do your visualizations, then publish). 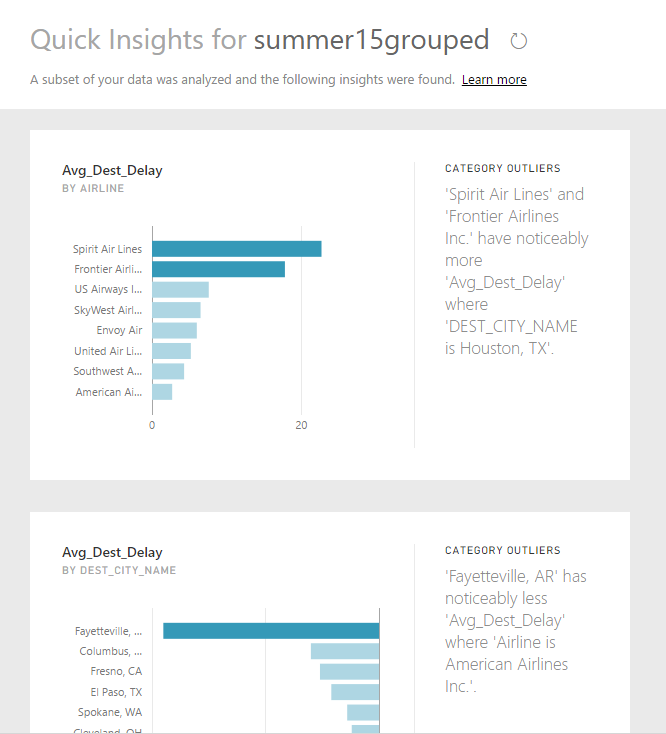 Quick Insights attempts to call out interesting aspects of your data. In order for this to work properly, however, your data needs to be in a format that it can understand. After looking at Quick Insights, go the main Power BI cloud page, sign in if you need to, click the three-horizontal-line icon at the top left to view the menu (if necessary), and you should see all your Datasets, Reports and Dashboards. If you already created visualization report pages in the desktop software before publishing to the service, they'll show up under Reports (your data, not surprisingly, shows up under Datasets). You can share a report directly to the web for public viewing, which then also allows you to embed it somewhere on your own website: Go to File > Publish to Web. Be advised that although this was free while in beta, I haven't seen Microsoft guarantee that it will stay free since it moved out of preview in early July. If this is private data you want to share with just a few other people, you'll need to share your work as a dashboard instead. If you'd like to share an entire report page as a dashboard, click the pin (thumbtack) icon just above the page and choose to add it to a new dashboard. You can also mix and match visualizations from different pages -- or even different data sets -- onto a dashboard by clicking on an individual visualization and then clicking on the pin icon at the top right of that visualization and pinning it to an existing or new dashboard. You can then click the share icon at the top right and share with others by entering their email addresses. You can embed web content, images, text boxes and videos into a dashboard from the dashboard itself; you can also create additional visualizations in a report and pin them to a dashboard, including adding "cards" that call out one or a couple of key metrics. You can edit your report in Power BI service by clicking the Edit Report link above the page and then pinning a new visualization to any dashboard. You can allow your users to ask natural-language questions by clicking the setting gear icon on the top (black) nav bar, clicking Dashboards and then the specific dashboard you want to edit. Click the checkbox next to "Show the Q&A search box on this dashboard." This feature lets you (or your dashboard viewers) generate new visualizations from a data set by typing in questions. Once I figured out appropriate formats for my queries, I found this a pretty compelling interface. For example, I imported data for monthly search visits to IDG's U.S. websites and then was able to view various slices of the data by typing in things like "Show me search visits by month for Computerworld" or "What month has the largest search visits for CIO". And while I could have created the same interactivity with slicers on a report page that I pinned to a dashboard, the value-add here is that users can ask questions that I didn't necessarily think to model for them. For the flight data, I queried my dashboard with questions such as "What origin city has the largest average security delay?" (Adak Island Alaska. Who knew?) 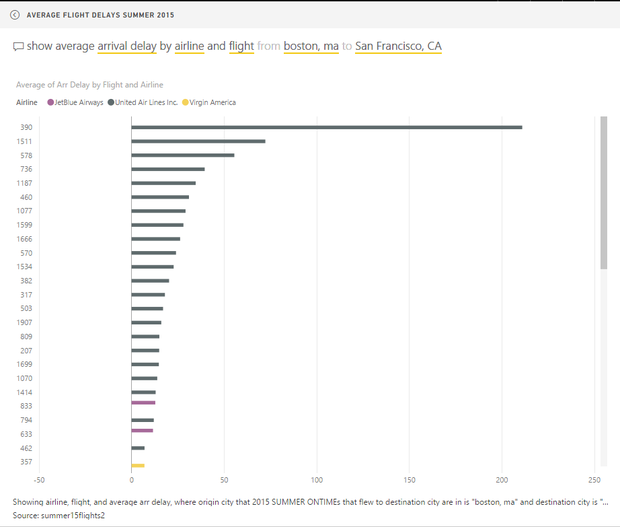 and "What destination city has the largest average weather delay from Boston?" As you type in something that Power BI recognizes as possibly coming from your data set, the word is underlined and you see choices for what to select. Do you want Boston in Origin City or Destination City? Click and pick. If visualization type -- such as column or bar -- isn't the one you want, you can specify one in your query. Power BI dashboards offer natural-language queries, underlining column names in your data sets. One quibble: Trying to pull data for a city like San Francisco or New York didn't work for me because the system didn't start recognizing the city name until I typed the fourth letter; three letters and a space didn't work so well. Fortunately, I could also use SFO (for San Francisco) or JFK and LGA (for New York) from the Origin airport code -- but that's something to keep in mind if you want to use this feature and have cities in your data. If your data doesn't have intuitive column names, you can add a "synonym" to a data model -- in Desktop only -- for alternate ways to refer to a column. Click on the Relationships icon in the left panel (it's the third icon showing three boxes), select the Modeling ribbon, and you should see a Synonyms icon and list of fields to the right. If you click in the text box under Origin City, for example, you can enter additional substitute names such as Leaving. In just a few weeks of working with Power BI, I found it to be a fairly intuitive platform for loading in data and quickly doing basic data exploration and visualization. As of the Microsoft Data Insights Summit in March, Power BI was missing some functionality I consider basic -- text searching for slicers, conditional formatting for tables, calendar data-pickers as slicers -- but Microsoft has made progress since then on improving the platform. Conditional formatting for tables was added in the May 31 desktop update, searchable slicers arrived in the June 30 update and Microsoft says better date-range pickers are in the works. The platform is being updated fairly frequently -- once a month for the Desktop, more often for the cloud service -- offering the promise of continued new features and functionality. And as an R user, I'm intrigued by the integration of R scripts within the software and Microsoft incorporating R graphics in the Power BI service (Pro account needed) -- although you definitely don't need to know or use R for Power BI. If you already use Excel -- especially on Windows -- or are otherwise a Microsoft shop with corporate data stored in Microsoft infrastructure, I'd recommend downloading Power BI, signing up for a free account and taking Power BI for a test drive. If you don't use other Microsoft products, it may still be worthwhile to try the platform if you want to do some quick data exploration and analysis and don't currently have a favorite platform, since Power BI will pull in a lot of other data formats besides spreadsheets, SQL Server and Microsoft Azure. If you are a full-time data analyst or commercial designer creating publication-quality graphics, this may not be for you. But if you don't need high-end customization and functionality while analyzing data and sharing your work, this could be an attractive alternative. If you program, you might be more comfortable preparing your data for analysis with a scripting language like Python or R; I know that I am. Obviously, you can prep some data with any scripting language, save a new file and then pull that resulting file into Power BI. But with R, you can run R scripts right from within Power BI, including refreshing data from those scripts right inside Power BI (the Desktop version). To run a script, go to Get Data > Other > R Script and you'll get a dialog box to execute an R script. You don't actually have to copy and paste your entire script into the dialog box; just use the R source ("path/to/filename.R") function, making sure you use the full path to the script. Any data frames that are creating by your script will then appear for possible import into Power BI. Power BI also supports a couple of Microsoft scripting languages: M (the Power Query Formula Language) and DAX (Data Analysis Expressions). M is the language that underlies querying and mashing up data. What you do in the Query Editor has M underneath. If you see automatically generated scripts in the formula bar within the Query Editor, that's M.
Once you've loaded your data from the Query Editor into the Power BI report view for analysis and visualization, the scripting language is DAX. It's designed so Excel power users will be comfortable, and has similar syntax and functions to writing Excel formulas. If you create a new column in your report view, the formula bar there is DAX. If you want to do a lot of complex data work within Power BI, at some point you may be interested in learning DAX. Like Excel formulas, though, DAX is not as robust as a scripting language like R. For example, its SUBSTITUTE function will just replace one exact text string with another and does not use regular expressions that can match a pattern such as "find the letter A followed by two or more numbers, with or without a space in between." Introduction to DAX -- a Microsoft Guided Learning tutorial with both text and videos. DAX 101 -- a video recording of a two-hour intro session presented at Microsoft Data Insights in March 2016. Introduction to Power Query (informally known as "M") Formula Language -- a quick overview and list of functions for using M to build data queries. Learn to use R: Your hands-on guide -- Computerworld's free PDF download for getting starting with R, including some simple data visualization techniques. Already know R basics? Download our Advanced Beginner's Guide to R.
R Language -- The place to go for all Computerworld's coverage of R.